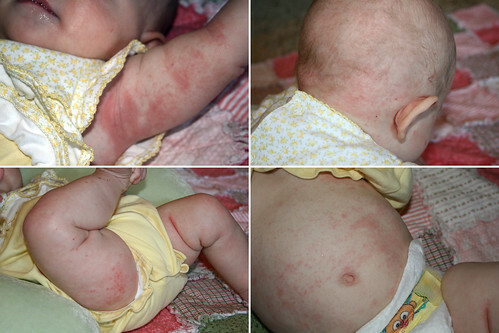 Looking for BABY ECZEMA PICTURES? The photos we collected are from various photo sharing sites. Pictures from parents who want to share with others what it is like to have a baby with eczema. This irritating and painful, sore and itchy skin condition is unpleasant to have at any age. No matter the age of the child, having a child with eczema, is always a great burden on any family. Baby eczema pictures of eczema on face, trunk and legs. Eczema skin is often described to be itchy, red irritated, dry skin. If there are moderate to severe baby eczema symptoms, the skin will also be raw and inflamed. It is hard to understand why babies this young have to go through such an ordeal. Very often the eczema becomes crusty, scaly and bleeding of persistent scratching as you can see of these close-up baby eczema pictures below. Raw, crusty and itchy patches so typical for eczema. Eczema can leave ugly white or pink patches on the skin or even a sandpaper like texture of the skin. Because scratching increases the risk of eczema scars it is vital you keep baby's nails short. You can prevent your baby from scratching during the night by letting him wear mittens or special pajamas that cover your baby's hands. 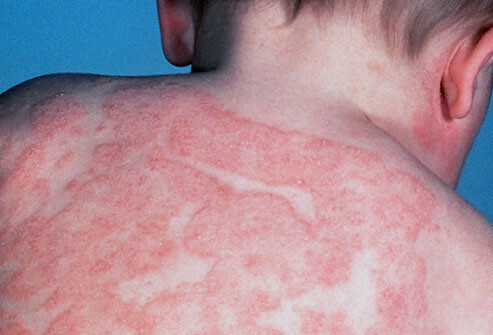 How to prevent atopic dermatitis in children. As there is no cure for eczema, most parents try to find a routine to prevent the regular break outs of eczema. Fortunately, there is much you can do to prevent these terrible flare-ups. Bathing and moisturizing the skin daily will strengthen the skin and protect it from irritants. Bath water should not be too hot as it will dry out the skin, and bath time should be no more than 10 minutes. Avoid shampoos and baby wash with fragrance. If you are not sure what to use look for products with a NEA Seal of Acceptance (National Eczema Association). Wash baby's clothes with fragrance free detergent and avoid fabric softeners. Dress your baby in breathable cotton clothes. Avoid hot and humid weather that causes excessive sweating. On the other hand, cold and dry weather can also trigger a flare up because it makes the skin extremely dry. 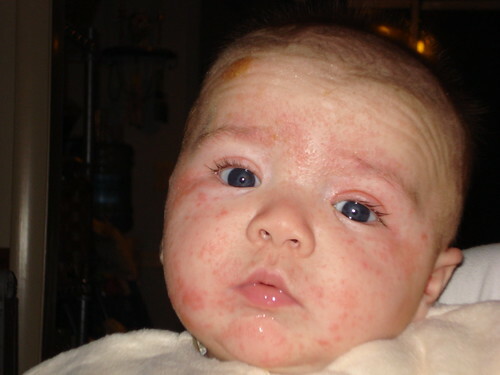 Baby eczema symptoms - What causes atopic dermatitis in babies? See photos of children with impetigo.